Two Chinook salmon swam 1.5 miles up Thornton Creek to spawn. completed by Seattle Public Utilities. For the first time in eight years, Chinook salmon were spotted spawning in Thornton Creek. Thornton Creek is the largest watershed in Seattle which includes a large central / south area of Shoreline. Thornton Creek is one of the most impacted streams in the region. Most nearby residents historically saw the creek as an obstacle to development and subsequently channelized and re-routed creek flows into ditches and culverts. More recently, some devoted advocates and the City of Seattle have restored some sections of the creek to regain healthier conditions. The creek now has some stretches of beautiful riparian forest, active beaver ponds, and clear springs. Unfortunately, the creek still has some room for improvements in habitat, with multiple undersized culverts and large stream sections that are still piped underground. Water quality challenges remain, including untreated waste from camp sites, leaking side sewers, and the runoff of polluted stormwater. In addition, there is a large population of invasive New Zealand mudsnails. Not surprising nearly half of this urban watershed is rooftop, driveway, roads, or parking – otherwise known as impervious surfaces. Impervious means that rainfall cannot infiltrate into the soil. Open space, parks and vacant land only comprise about eight percent of the watershed. 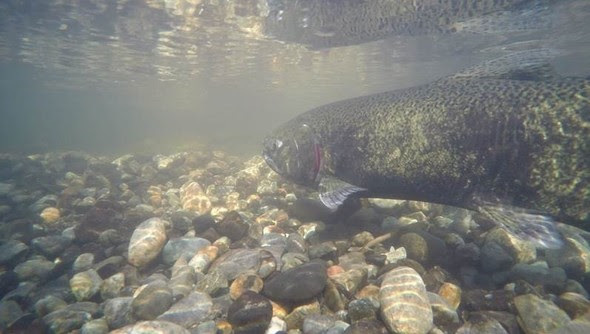 The return of two Chinook salmon to Thornton Creek to spawn is very exciting and a good indication that we’re on the right track. Further habitat restoration, culvert replacement, and stormwater and pollution controls can lead to improved recovery for Thornton Creek and other streams in the region.